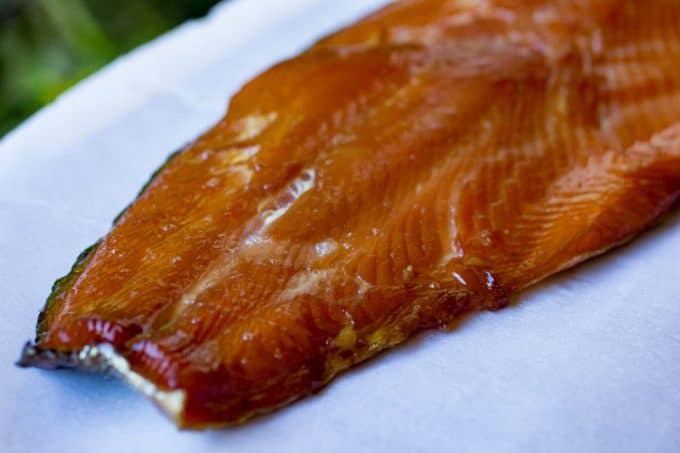 This recipe for Traeger Smoked Salmon is so easy to make, and you will be amazed at the flavor of home-smoked salmon. 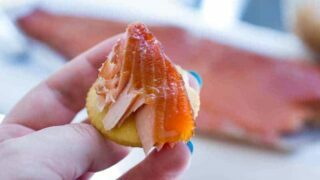 This recipe is a must make for anyone who loves smoked salmon. 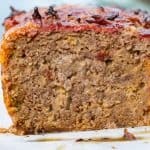 A very simple recipe that you can make over and over. Smokey, sweet, melt in your mouth salmon that is brined and slow smoked on your Traeger grill. One of our favorite ways to use all of the awesome salmon that Jeremiah has been catching has been to make fresh Smoked Salmon. Salmon is such a super protein to incorporate into your diet and smoked salmon is one of my favorite treats to have. 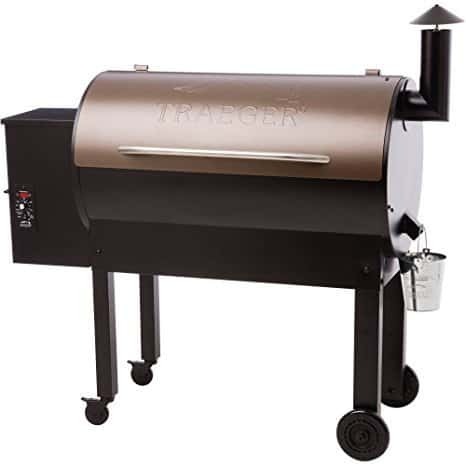 Hungry for more Traeger Recipes? 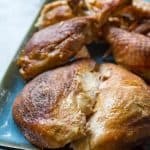 Check out my Traeger Recipe Collection! 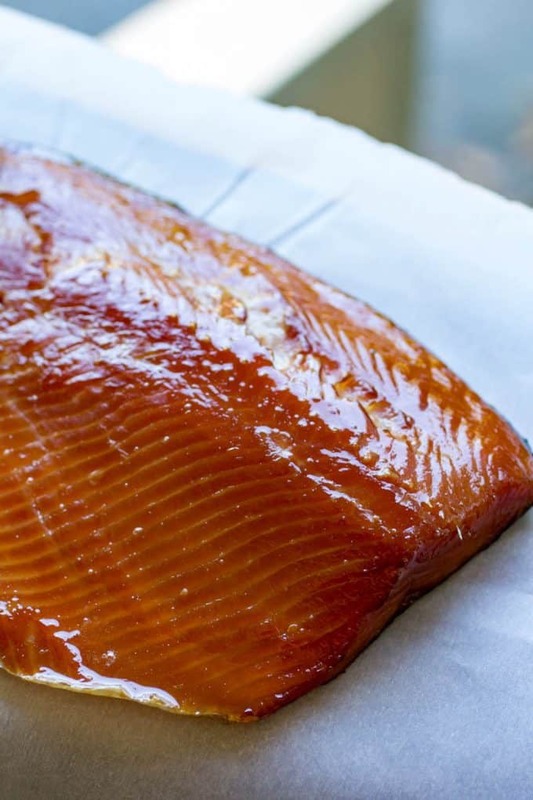 What Makes Smoked Salmon So Delicious? With a little homemade brine and some slow smoking, you can create your own wood-fired salmon that tastes better than what you can buy. Low and slow is the key for that rich flavorful smoked salmon taste. 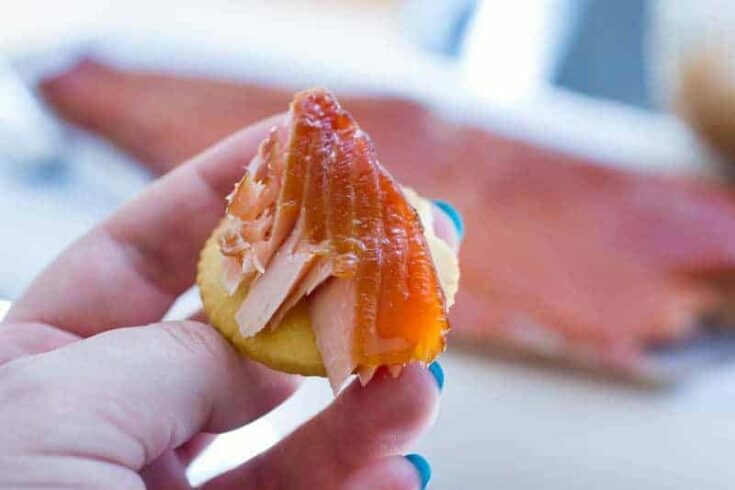 There are tons of ways you can eat smoked salmon! Flake it and make a salmon salad, top some salmon on a cream cheese bagel, eat it plain, create a smoked salmon platter, and more. 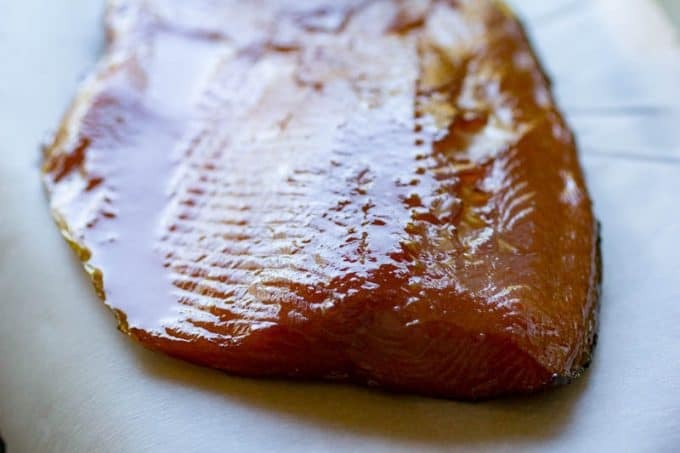 The beauty of smoked salmon is it is so versatile, and you can use it in a ton of ways from slicing and eating it plain to a handful of ways and more. 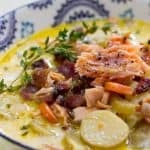 What Should I Serve With Smoked Salmon? 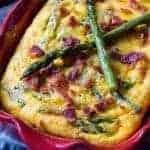 You can serve this simply with crackers and cream cheese, in a smoked salmon eggs benedict that you will die for, or even on top of a pile of alfredo instead of the chicken or shrimp. My wood pellet grill has come in handy when smoking salmon because you can maintain a specific temperature that fits your needs. For the process of smoked salmon, you want to cook on low heat for a long period of time. Our Traeger has a temperature gauge right on the front so I can see the temperature all the time. If you get a fancier one than I have, I think there are even apps that you can use to control things from your phone. I haven’t gone that route yet, but you’d better believe that I will be. The temperature control has helped make sure I don’t cook too high and ruin the salmon. If your salmon gets too hot, you will have such a tough piece of meat and you will probably end up tossing it out. Make sure to brush your salmon throughout the cooking process to seal in moisture to the fish to help it from drying out and it will give an element of flavor. The process is pretty easy if you maintain temperature. Do You Have Any Grilled Fish Recipes? Oh yeah. You came to the right place! I’ve got this awesome Lemon Dill Salmon that you’ll love, and more awesome options in the works. We also have an amazing Grilled Walleye recipe with a Lemon Cream Sauce that’s one of the best pieces of fish I’ve ever had in my whole life. 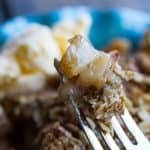 Real maple syrup is a must for this recipe. Please don’t waste your time on the imitation. Real maple syrup is going to help give you the sweet to your smoky, and fake maple syrup will not do. You will ruin your salmon, so make sure you spend the money and buy real maple syrup to slather onto your gorgeous filet. We find better success when we smoke with the skin on. It helps to keep the fish from falling apart, so keep the skin on the bottom of your filet and smoke away! After you are finished smoking your fish, you want to let it rest for around an hour on a cooling rack. Once it is completely cool, wrap it up in plastic wrap and place in the fridge. Your smoked salmon will keep for around 8-10 days. Now, if you have a vacuum system you can vacuum seal your fish for a lasting time of around 3 weeks in the fridge, or you can toss in the freezer and it will last for up to a year. 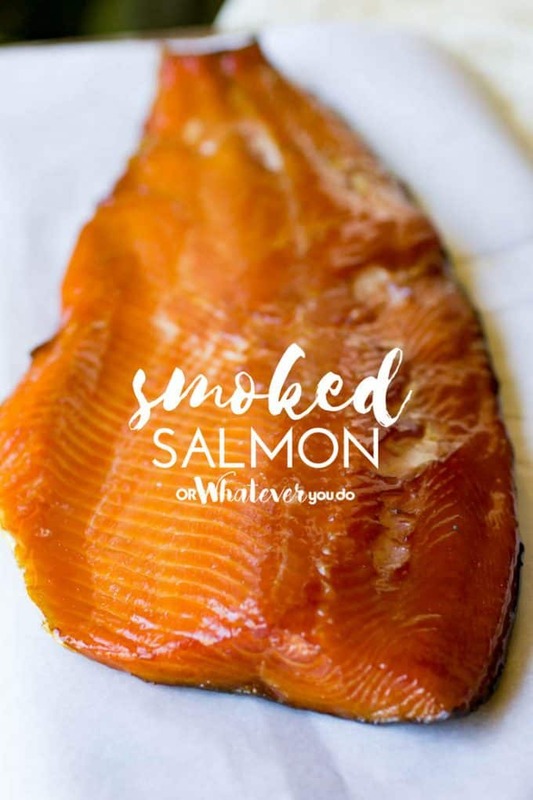 This is a great smoker starter recipe, and for anyone who loves salmon. I have easy directions to follow, to help give you that final product that you will love and keep making over and over again. This is my tried and true recipe I keep on hand and make a handful of times throughout the year. 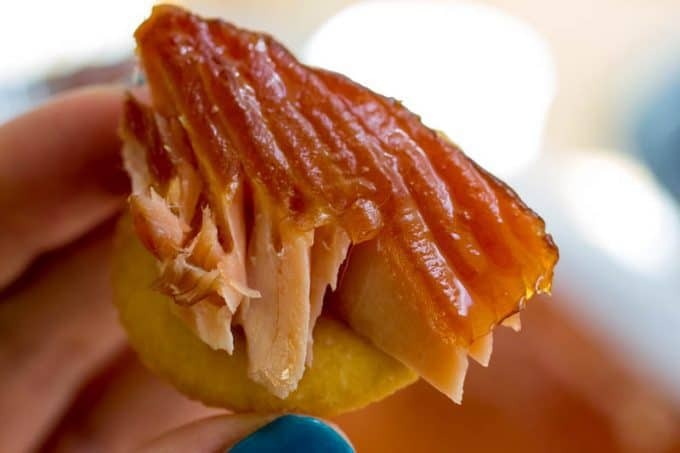 Easy and delicious Traeger Smoked Salmon recipe. Homemade taste, fresh flavor, delicious real maple glaze. Combine brine ingredients until the sugar is dissolved, and place into a large ziplock baggie or large covered container. Place your cleaned salmon into the brine, and refrigerate for 10-12 hours. Once the fish is brined, remove from the liquid, rinse quickly, and pat dry with paper towels. Let sit out at room temperature for 1-2 hours to allow the pellicle to form. Turn your smoker to smoke to get the fire started, and place the salmon on a cooking rack that's been sprayed with cooking spray. Once an hour, baste the salmon with pure maple syrup generously. 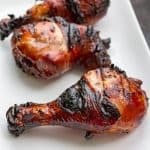 Don't let the smoker get above 180 degrees for best results. Thank you so much, Corky! I’m so glad you liked it! I’m going to be smoking up a bunch myself this week to bring to my coworkers! 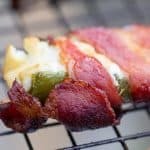 I am going to try this on my Louisiana Grills pellet grill in a few days! Unfortunately, mine doesn’t have a “smoke” setting. Do you have any idea what temperature “smoke” is? Hey Tasha! 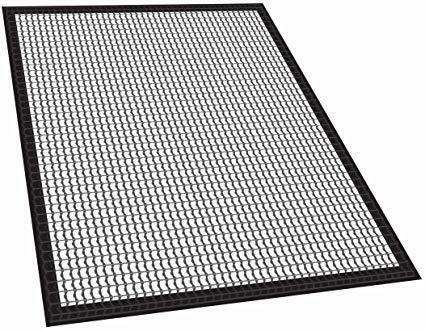 We smoke it at 150-160° for 3 – 3.5 hours. 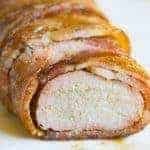 I’m sure this will be amazing on a Louisiana! 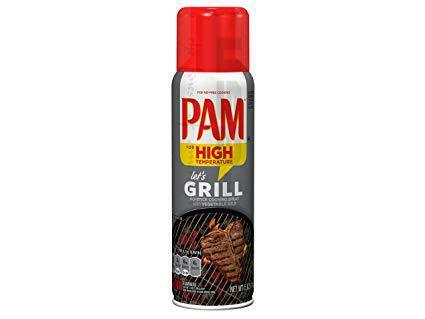 We leave it on smoke the whole time. Don’t let it get or stay above 180° for ideal results! As far as pellets, we use a lot of Hickory around here, but have definitely ventured into Cherry, and Maple works well too, especially with the maple syrup. Nicole, that recipe looks so yummy! I’ll have to try that one. Thanks for sharing. That’s awesome! We have had the same experience as well. Thanks for stopping by to let us know!